Rice pudding recipes may vary greatly depending on the country of origin, but typically rice puddings include the following ingredients: rice, milk or water, spices and flavorings. When served as a dessert, it typically contains a sweetener such as sugar, honey, or syrup. Baked rice puddings sometimes contain eggs. In the United States and Canada, most rice pudding recipes were brought by European immigrants. 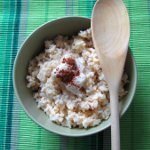 One of the most popular variations is made with long grain rice, milk, sugar or maple syrup, raisins, cinnamon, and nutmeg. The pudding is first partially cooked in a bain-marie and then baked in an oven until ready. To celebrate National Rice Pudding Day, treat your family to a delightful rice pudding with orange zest and pistachios. In a saucepan, mix 1/4 cup rice with 2 1/2 cups milk, honey or sugar to taste, and zest of 1/2 small orange. Bring to boil, reduce the heat, cover and simmer for 75 minutes, stirring regularly. Remove the lid and cook until creamy, stirring. It will take about 15 minutes. Pour in 2/3 cup cream and simmer for about 5 minutes. Sprinkle with 1 tbs chopped pistachios before serving.